Kat Ilich has a Bachelor of Arts in sociology, communications and lm from Central Queensland University, and has worked in a number of media and communications roles for large-scale construction and performing arts companies. During her tertiary education, she studied professional and creative writing, as well as script writing for stage and screen, and previously worked as an actor and model in Brisbane. She had long been writing short stories and poetry for herself, and began to explore children’s ction after falling pregnant with her son. Kat began to collect her favourite picture books from her own childhood, and noted their shared dance of rhyme, playful intonation and memorable repetition. 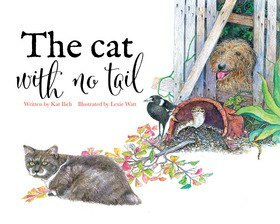 The Cat with No Tail is inspired by a family legacy, and Kat hopes it will not only delight her young readers, but also promote con dence and strength in each individual who reads it. Kat lives in Mackay, North Queensland, with her two-year old son Percy, her husband Tony, and her cat named Meg.